Occasionally I will have problem of growbed clogging, this mostly due to pebbles that is small in size was use in my set. This smaller pebbles will cause fish solids to get trapped and eventually compromise the siphon water supply. 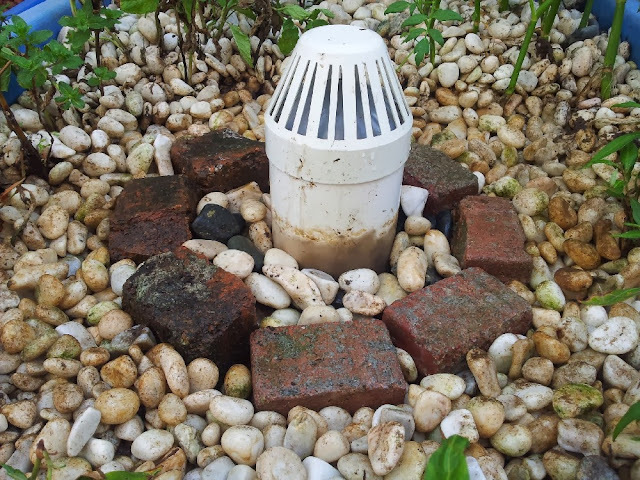 A quick way of rectifying this is by making a "Brick Barrier" and filling the inner part of it with larger pebbles and finally top it up till full growbed height. Above is a temporary measure if time or situation did not permit full growbed overhaul. There is also occasion where I use this Brick barrier as a replacement for the strainer itself, arranging it more tightly using the narrower part of the brick or less number of brick used. "A quick way of rectifying this is by making a "Brick Barrier" and filling the inner part of it with larger pebbles and finally top it up till full growbed height." Why do you have to put larger pebbles in there? Why not just leave it as empty space (water only)? which was on 2010 September, so just trying different way I guess. Another reason why I did like this is because, the brick is low. I want the growbed to be at least 10 inches, it will be above the brick level.